Colour code needed for this Hayabusa? 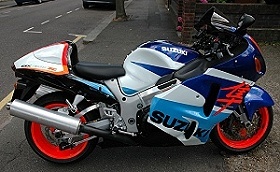 Shaun sent in a picture of his Hayabusa hoping to find out the colour scheme for his Hayabusa. I have no information on whether it is a country specific Ltd Edition official, dealer mod or otherwise so - if you know the colour code or even own one like this please contact me! Thank you - everyone who filled one in. Sensible results listed on this page! What is this Hayabusa's colour code or scheme? *More information about this bike can be read on the results page. Do the latest tyre survey!